Effective collaboration could once be defined as hanging around the company water cooler discussing the latest network issues and emerging trends. Thanks to the ever-increasing complexity levels and scale of today’s networks, however, these casual conversations can no longer be classified as an effective method of information sharing. As network size and complexity increase, so do network teams. Enterprise networks are no longer operated by small teams in a single location, but teams of varying technical skills and diverse geographies. If network teams want to be on the same page as the rest of their IT counterparts with the ability to respond quickly to a network issue, new forms of collaboration and information sharing are required. The new era of collaboration requires an effective strategy that ensures vital information is shared across teams. However, in a recent NetBrain survey, 72 percent of network engineers cited a lack of collaboration between teams, specifically network and security teams, as the number one challenge when mitigating an attack. Due to increasing network complexity, these teams have become more siloed, making ongoing communication difficult. This becomes problematic when a network outage arises and teams don’t know how to jointly respond as they have little to no experience working together. The result? Hours wasted on communicating issues that should be standard procedure rather than swiftly addressing and repairing the problem. Many network teams are combatting this issue with a multi-phase approach to improve collaboration, process and tools. When it comes to the network, automation is a critical enabler for all stakeholders by providing the ability to share domain expertise and operational data during network problems. The simplest form of collaboration is knowledge-sharing. This means making sure that everyone tasked with managing the network is equipped with the appropriate information to perform their job optimally. While it seems simple, the approach can be a significant challenge for any enterprise network team. Today, teams struggle to document and share knowledge as the process is time consuming and tedious. This limits the ability to scale as critical network information is often stored in the brains or hard drives of tribal leaders who have worked on a specific network for many years. The domain knowledge is far too deep. While tribal leaders have spent years honing their skills and learning the ins and outs of their networks, organizations can be at an advantage by ensuring more network engineers are equipped with similar levels of information. For instance, what happens when a busy, senior Level-3 engineer isn’t around to troubleshoot a network outage? 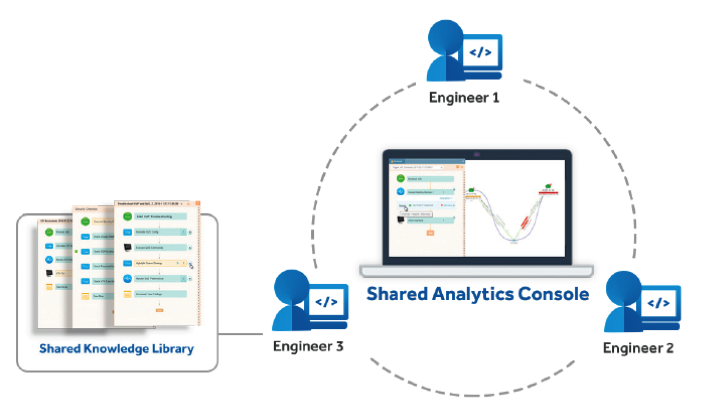 Democratizing her best practices so that more junior engineers (i.e., Level-1 and Level-2 engineers) can diagnose the problem, instead of waiting and escalating all the way to the Level-3 engineer, can result in quicker response times and better SLAs. While sharing best practices is critical, collaboration is more than just a clear picture of how to do the work. Sharing is also crucial at the task level where insights and conclusions should be made as a team. However, organizations often struggle with this process—many network teams communicate via email or web conference, and here, data sharing becomes cumbersome and comes in log files or data dumps. Drawing key insights and actionable decisions from a data dump is difficult. Even if an individual has the right insight he or she needs for the task at hand, it can be time consuming and tedious to work through. These manual methods of data collection and sharing (e.g., box-by-box, screen scraping or legacy home-grown scripts) result in slower troubleshooting and a longer mean time to repair (MTTR). Take the example in a typical network operations center. Here a high degree of redundant work can happen as Level-3 engineers often have to repeat the same tasks as Level-2 engineers, and Level-2 engineers have to do the same with Level-1 engineers. The culprit is largely a poor flow of information disguised as incomplete documentation at best and incorrect documentation at worst. Instead, by providing network teams with a common visual interface—for instance, a map of the network’s problem area—they can access the most relevant data while utilizing shared insights to accelerate decision-making. While collaboration is critical to network troubleshooting, it becomes particularly essential when the network comes under attack. During a security incident, the network team typically works with the security team, the applications team, and related managers. With so many stakeholders involved, centralized information becomes imperative. That’s why it’s critical to democratize best practices and seamlessly share information to drive shorter repair times and better proactive security. Again, automation plays a key role. For instance, by automating the creation of the exact attack path, network and security teams can quickly get on the same page by gaining instant visibility into the problem. Moreover, when diagnosing the problem, automating best practices contained in off-the-shelf playbooks, guides, and security checklists is essential. Digitizing those steps into runbooks that can be automatically executed—and capturing runbook insights so they can be shared across network and security teams—results in faster responses and less human error. As shown in the graphic, these runbooks can then be enhanced with lessons learned from the security event to improve responses down the road. As networks are increasingly at risk, organizations that learn from the past to improve their future will be at an advantage when it comes to mitigating future threats. The bottom-line is that the scale and complexity of networks is changing how organizations respond to network issues and security threats. Automating critical data-sharing will foster better collaboration and results than the water cooler ever did. Grant Ho is an SVP at NetBrain Technologies, provider of the industry’s leading network automation platform. At NetBrain, he helps lead the companies’ strategy and execution, with a focus on products, events, content and more. Prior to joining NetBrain, Grant held various leadership roles in the healthcare IT industry and began his career as a strategy consultant to wireless and enterprise software companies. You can follow Grant on Twitter @grantho and you can follow NetBrain @NetBrainTechies. Should Amazon Just Buy FedEx for the last mile?